Every day is a happy day on the Great Impressions' blog! Today is no exception, so Happy Thursday! These stacked teacups remind me of quiet early mornings...something I rarely experience with school-age kids in the house. But don't worry, I'm enjoying every. noisy. minute of it! The shimmer & shine on this card is amazing IRL! 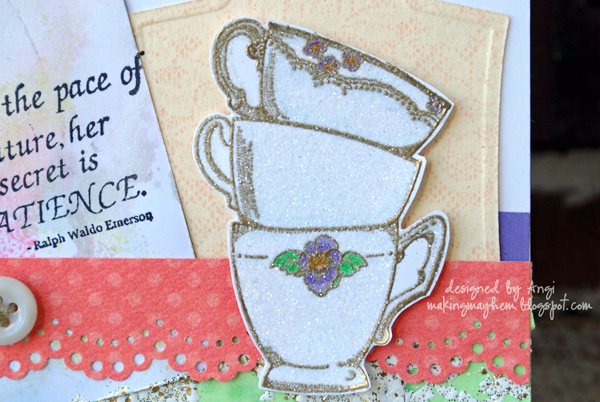 When April's Stamp of the Month boards were revealed, I knew I needed the Patience (D445) stamp; it would go perfectly with the Elegant Teacups (F389) and the design I had in mind. 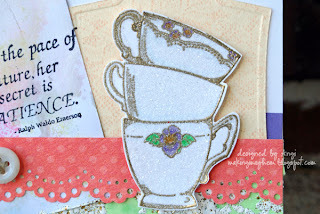 I wanted this card to have shine and shimmer like those gilded, porcelain tea vessels. Do you see the Lace Background (K97) behind the cups? Glitter, embossing enamel and powder, paint and inks were all played with to pull this card collage together. 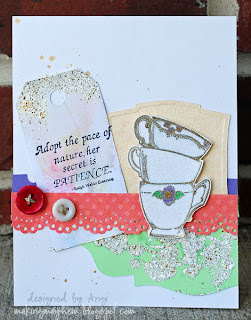 If you're interested in the techniques I used on this card, stop by my blog for more info. April's Great Impressions' Monthly Challenge is open and the theme is "Lots of Flowers." Check out that post for the details and to enter your project. Remember - a Great Impressions stamp is *not* required, but if you do use one you'll get 2 entries! Very pretty and unique card Angi! I agree with Jenny! It's very pretty! 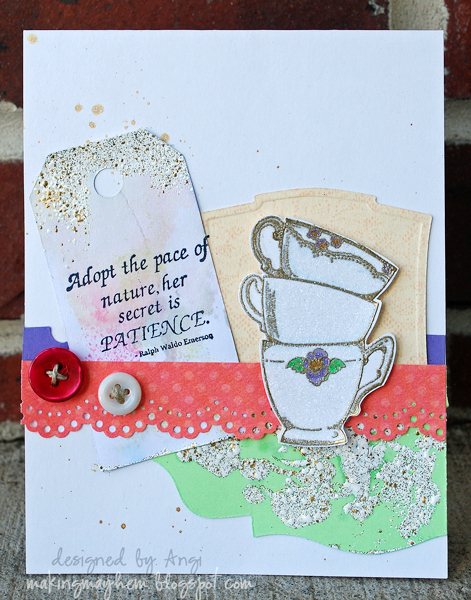 I love that lacey scalloped border and the fun tag you added.